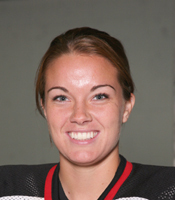 St. Paul, Minn. - The Lake Forest College women’s hockey team opened the season at a pair of Minnesota Intercollegiate Athletic Conference teams over the weekend (November 4-5). The Foresters skated to a 2-2 tie at Augsburg College on Saturday before prevailing 5-3 at Hamline University Sunday afternoon. It was also Augsburg’s season opener and Hamline fell to 0-1-1 on the young season. Things got off to rough start for the visitors on Saturday as Augsburg scored just 24 seconds in to the contest. The home team scored again at 11:08 in the second period and entered the third with a 2-0 lead. Junior Laura Wilson (Corunna, Ont./Sarnia Sting) finally put the Foresters on the scoreboard at the 3:23 mark of the final stanza. She was assisted by freshman Jamie Sauer (Eagle River, Wis./Northland Pines H.S.). Junior Jen Clouthier (Aurora, Ill./Chicago Mission) then scored the game-tying goal at 9:43 off an assist from classmate Courtney DeHoey (Chatham, Ont./Bluewater Jr. Hawks). Senior Sally Bevis (Huntington, N.Y./North American Hockey Academy) stopped 18 of 20 Augsburg shots on goal to earn the tie. Freshman Ryann McCarthy (Lombard, Ill./Team Illinois) made her Forester debut in goal on Sunday, recorded 28 saves, and was credited with the victory. Hamline took the lead 5:20 into the game. Wilson converted a power play opportunity at 10:03 to tie the score and the teams were held without a goal for the rest of the period. Senior Katie Snowden (Toronto, Ont./Willowdale Redwings) and junior Amalia Vriend (King City, Ont./Markham Stouffville Stars) assisted on the Wilson score. Lake Forest took its first lead of the season just 99 seconds into the second period on freshman Sam Pinsonneault’s (Manchester, N.H./New Hampton School) first career goal. She was assisted by classmate Courtney Bean (Peoria, Ill./Team Illinois). The Pipers tied the score on a power play goal at 3:34 before Wilson put the visitors ahead for good at 13:50. Clouthier assisted the shorthanded goal. Snowden and DeHoey then helped Wilson complete the hat trick with another power play goal at 17:21. The home team pulled back to within a goal 27 seconds into the final period but the only score the rest of the way came from Wilson on the power play at 15:16. The school record-tying fourth goal of the game was assisted by DeHoey. The Foresters’ home opener is Friday (November 10) night at 7:00 against the University of St. Thomas. The same two teams will face off again at 2:00 the following afternoon.